I am a mother of 3, my last one was in July of 2013. I was obese at the time, and my son was a 10-pound baby, so my canvas was not the cleanest when I set myself to lose weight. I went from an unknown weight (probably 180, 5ft2in) down to an average of 130lbs. I’m very athletic, run, cycle, and a good amount of strength training. My diet is dang-near impeccable, with occasional slips on date night, taco Tuesday, or a glass of wine after a long day. What I’m getting at is: I am doing everything right…as best as I can! But my mommy belly will not go away. It’s like I have a thick shield of fat on top on my abdomen that doesn’t match the rest of me. 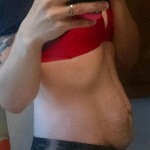 I’ve made peace with saggy, stretchy, stripey skin…but the belly fat is pretty unwelcome. I have read all kinds of health columns, and have been patient, but it seems like there is no use. Is there anything I need to know that the columns aren’t telling me about the realistic expectations I should have about my fat? Am I truely an exception to all of the advice out there on the WWW? Please help give me hope or at least peace of mind. I’m tired of feeling like a failure. ~The age of my children, and how far postpartum I am: 6, 4, and 3. Three years postpartum. I have been told by a friend about an herbal tea supplement Mummy magic tea that helped her and later me to shed our pregnancy weight. I gained 33 pounds with my pregnancy and while bfing my LO I dropped those pounds off. You are in great shape! I have a similar issue with my stomach. It’s not the fat necessarily, as the body does need to maintain a certain amount in order to be healthy. It’s the lose skin! The excess skin allows the fat to lay loosely, away from the muscle, making it look and feel like much more than it is. Excess skin can’t be helped or exercised away and it’s not something you could have prevented (especially with a 10lb baby and a petite mommy). It’s completely natural and a common result of pregnancy, despite what society tells us. You are beautiful and doing your body an amazing favor by staying healthy. Don’t let your tummy get you down. You look amazing. So fit. IM only 4 months post partum and look much worse but I feel this will be me. I think less cardio and more focused muscle strengthening and building in the core will help a lot to burn what little fat you have there and fill the skin with abs. Lots of cardio will cause you to be almost too lean and your skin sag more. Work on building curves to fill the skin. I recommend contacting a trainer like Natalie Jill who has experience with abs postpartum. She has a visible six pack but also loose skin. But again, you look totally awesome. I think you look amazing. Based on your pictures it doesn’t look like you have additional abdominal false and instead it is just skin. I am 33 and have had two (large babies) and I have been very lucky to get back into previous shape rather quickly. I contribute it to powerlifting and heavy weight lifting. As well as eating a clean diet that is whole food based. It’s amazing what weight lifting can do for your core.